Minimizing your toolset not only reduces costs, but it will result in faster, agile, and more efficient IT operations. Rushing headlong toward the cloud without a holistic monitoring strategy can create more problems for your enterprise than you hope to solve. According to a recent Gartner research paper, How to React to the Impact of the Cloud on IT Operations Monitoring, by 2021 only 15% of organizations will have implemented holistic monitoring for their cloud investments, leaving $255 billion in associated cloud investments at risk for those that take a piecemeal approach. The challenge for organizations seeking to embrace the cloud’s cost efficiencies is that, with rare exceptions, your IT environment and services, by necessity, consist of a wide variety of technologies and tools spanning multiple clouds (In fact, a recent report finds that the average company uses almost 5 clouds). And if you’re one of the companies that have already started moving to the cloud, then there’s a strong likelihood you’re currently grappling with this reality. Today’s complex and hybrid networks are made up of legacy systems, public and private cloud infrastructure, software-as-a-service (SAAS), platform-as-a-service (PAAS), containers, mobile devices and more. The blend of these stable configuration items coupled with ephemeral technologies such as virtual storage and compute instances that are here one moment and gone the next is creating major visibility problems for IT operations. You can’t manage what you can’t see, and for far too many enterprises, the management platforms you’ve come to rely on are nearing end-of-life so are no longer being supported. These siloed legacy tools can’t handle cloud tech, and they don’t play well together, leaving IT ops in a quandary. The end result is gaps in service visibility and an unwieldy, inconsistent set of tools to monitor and manage across IT operations. It also means the cost savings you hoped to enjoy by migrating to the cloud could be lost through vastly inefficient operations. Below, and in the paper, there’s a chart that perfectly illustrates the challenges. 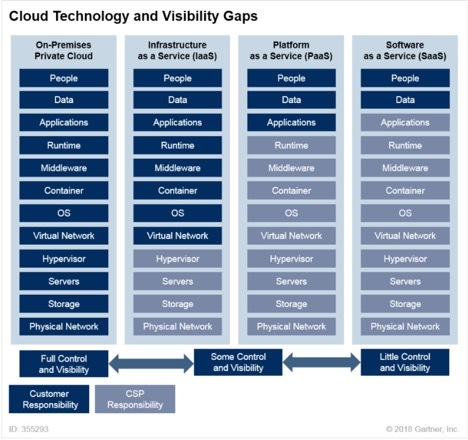 An enterprise that invests in a private cloud may have complete visibility inside that cloud, but as assets are added —IaaS, PaaS, and SaaS— it becomes increasingly harder to maintain full visibility and control. In the end, IT Ops is left guessing about what’s in its environment, playing a painstakingly inefficient and costly game of hide and go seek. Exerting full control over your cloud environment requires taking a real-time inventory of the cloud(s), technologies, vendors and tools in use across your enterprise. While taking inventory, identify opportunities for automation and tool consolidation or replacement that can reduce licensing, maintenance, and operating costs, while increasing cross-domain visibility. You may find that some of your tools are at or nearing end-of-life, have gaps in visibility to the latest technologies, or may be redundant to the capabilities offered by newer tools. And you may find that some of your tools have limited focus such as some to the new cloud-native platforms that lack support for data center infrastructure. In their paper, Gartner details the types of tools suited for monitoring various elements in your cloud environment and provides insight into opportunities to eliminate redundancy. It also addresses areas of specific and general skills that are necessary to train or hire to ensure your IT ops staff keep pace with the progress of your digital journey. One easy to overlook issue is the effect on operations when personnel, who may be exceptionally skilled in the tech silos they’ve been working in, suddenly find themselves outside their comfort zone. Cloud migration is too often driven with the end user in mind and not the staff who make it happen. This newly released Gartner paper will help you formulate a holistic monitoring tool strategy that will serve you well into the future. If you’re ready to minimize your toolset and transition to a single platform that can intelligently monitor and manage your IT infrastructure, applications and business services, we’re happy to help. Here’s a perfect example of how one company consolidated their IT tools to tame the multi-cloud tempest.